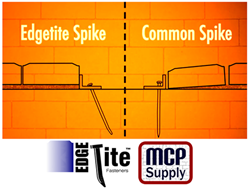 MCP Supply offers a hardscape paver project repair solution for shifting pavers and believes installers will appreciate customer satisfaction in the “doing it right the first time” approach with this innovative 10 inch paver edging spike. It is truly amazing how there always seems to be plenty of time and money to repair a project but not enough time to do it right initially. Wouldn’t it be great to get projects completed properly when the project is first completed? 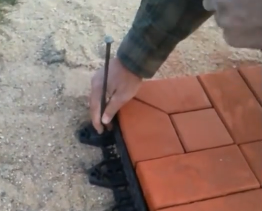 There is a lot of cost and time put into any paver/brick project, let alone sweat and toil! Here is a precision engineered product that gives customers both a great repair solution for shifting hardscape pavers and a way to “get it right the first time”. Most hardscape paver installers try to minimize costly future repairs on any project to avoid those dreaded customer call-backs. This product is innovatively designed to lock hardscape paver edging tight against the pavers. 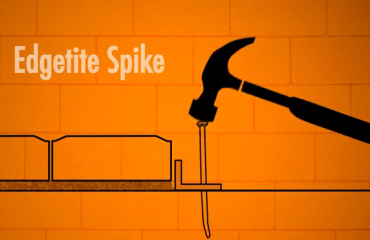 This EdgeTite™ 10 inch spike is a great way to offer customers the most effective solution against the natural forces of frost heaving and changing temperatures in this industry. MCP Supply’s VP of Sales said this when asked why he thinks this product is the right choice in retaining spikes; “try to imagine assembling a car or any mechanical assembly for that matter without taking time to make sure all the fasteners are tight. 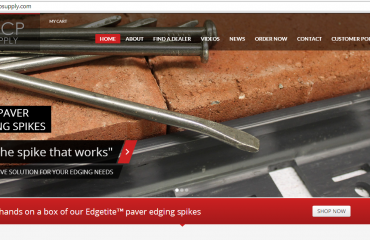 That’s effectively what the industry is currently doing by using spikes that don’t have the functionality to increase tension between the hardscape paver edging and the related paver”. He goes on to say “this industry has been trying to solve the problem of frost heaving and natural paver shifting for a long time. We believe we have that solution”. MCP Supply is a successful technology and sourcing company that focuses on innovative products that make a difference by improving the construction industry wherever possible. Located in south central PA, MCP Supply currently has distribution hubs located in South Carolina, Illinois and at its headquarters in Lewisberry PA. MCP Supply invites the readers to review the testimonials on their website and watch the video link provided below. Contact MCP Supply or visit their website for 2014 early bird special pricing.